The routes, paths and tracks of the Alpes-Maritimes provide access to a special place where you can visit, against a tranquil backdrop, some beautiful natural sites. It’s up to you, depending on your needs, to come up with original mountain bike circuits, between valleys and rivers, forests and alpine pastures, villages and hamlets. Mountain biking sites which have received the "VTT-FFC site" federal label are design to let you ride with freedom, through tranquil and beautiful country! 5 FFC-mountain biking spaces are labelled as such in the region: Tende/La Brigue, Sospel/Peille, La Colmiane, Levens, Peille. Among the numerous mountain biking routes you will find in the Alpes-Maritimes, these are the essentials, which will let you enjoy your passion to the max. This technical guide, published by the Conseil Général des Alpes-Maritimes, suggests 35 routes of all difficulty levels, to allow anyone who wants to practice this sport throughout the department. 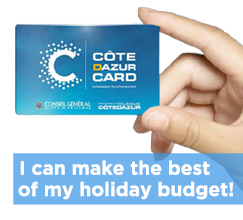 Each route is precisely described: geographical location, access, difficulty, level…. VTOPO is a publishing house specialised in the publication of mountain biking topological guides. For the Alpes-Maritimes, 142 extraordinary routes have been selected to cover the most beautiful mountain biking routes in the region, from sea to mountain. A network of itineraries covering more than 2,000 km to meet the requirements of all: from mere tracks of flattened earth to difficult routes aimed at the most seasoned sportspeople. Tracks are all identified by international signposts which mean you can go from Italy to France and vice versa without losing the path. A route through the foothills, from Thonon-les-Bains to the Mediterranean. An almost 100km long route in the Vallée de la Tinée. With a descent of 1,120 m, Auron/St-Étienne de Tinée offers more then 60 km of downhill routes, with 18 circuits covering all levels. The mountain biking area is served by 3 mechanical lifts including a detachable chair-lift. New for summer 2012: the creation of 4 extra circuits. The resort offers 12 downhill routes and bike park modules. A "soft version". Numerous signposted routes from the village, the col de la Couillole or via chairlift to the Station des Buisses are open to mountain bike beginners or experts. Green and blue routes. "Hard version": following in the footsteps of champions. 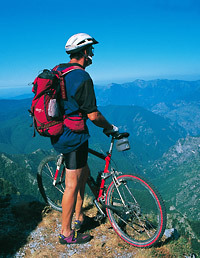 With downhill mountain biking, Roubion offers downhill biking, endurance, cross country and sporting routes. Tracks of all levels (blue, red and black) are accessed by a chair lift. 12 downhill routes of all levels, accessed by a chair-lift. A beautiful area, technically very difficult. Whether freelance experts or members of various organisations, mountain biking experts in the Alpes-Maritimes will give you all the support necessary in terms of safety, information, about this activity. Ask them about the different formulae they offer, to suit your level.